Do your eyes itch, burn and turn red when you wear makeup? Although cosmetics are supposed to enhance your appearance, you may feel anything but attractive as your eyes water and your makeup runs. Luckily, it's possible to look your best without enduring any pain or discomfort when you follow these tips. Makeup can easily travel the short distance from your eyelashes or eyelids to your eyes, triggering sensitivity and dryness. The problem can be particularly painful if you wear contacts because the lenses trap the particles and prevent them from being washed away. If you have sensitive eyes, don't apply mascara to the roots of your lashes and use eyeliner on the outer part of your lids only. University of Waterloo researchers conducted a study that examined how much glittery eyeliner entered the tear film when the product was used on either the inner or outer eyelids. The tear film is a protective layer of tears that keep your eyes constantly moist. When study participants placed eyeliner inside the lash line, 15 to 30 percent more particles found their way into the tear film in just five minutes. When you're exhausted, removing makeup may seem like an unnecessary step. Unfortunately, failing to remove eye makeup can clog oil glands, causing infections and styes on your eyelids and pimples on your face. Gentle cleaning products that don't contain fragrances, oils, diazolidinyl urea or sodium lauryl sulfate are the best choices if you have sensitive eyes. Brushes and applicators may look perfectly clean, but can still harbor bacteria. Clean them at least once a week with a mixture of warm water and baby shampoo to reduce sensitivity and prevent infections. After your brushes and applicators air dry, place them in a covered container. Never store makeup on a bathroom vanity or the back of a toilet. Every time you flush the toilet, bacteria can travel through the air and coat nearby surfaces, including makeup brushes and toothbrushes. Clean brushes won't matter if your fingers are covered in dirt, dust or bacteria. Before you apply any product to your face, spend a few minutes washing your hands. Sharing makeup increases your risk of developing a bacterial infection. No matter how close you are to friends or family members, the last thing you want to do is catch an infection from them or expose them to bacteria from your makeup. Contamination can also be a problem if you use testers at makeup counters. Ask if small, personal-size sample sizes are available instead. Have you ever been tempted to take advantage of a free makeover at the cosmetics counter? Before you do, ask the employee to clean the brushes and applicators he or she plans to use on you. Spend a few days makeup free if your eyes start to itch and burn. Once your eyes feel more comfortable, reintroduce your usual makeup products one at a time. If sensitivity returns, get rid of the product causing the problem. If one particular type of product, such as brown eyeshadow, causes frequent problems, avoid that product in the future. In some cases, sensitivity may occur if you're allergic to the pigment that gives the eyeshadow its color. Keep in mind that it's possible to suddenly become allergic to a makeup product even if you've used it for years with no previous problems. 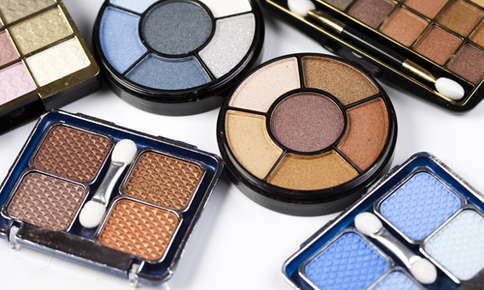 Replace eye makeup every three months to prevent bacterial infections. Pay attention to expiration labels for other makeup products, such as blushes, bronzers, and lip products, and trash these items when the "use by" date arrives. Stay away from products that claim they'll make your eyelashes so thick you'll swear you're wearing false eyelashes or boast that a super special ingredient will make your makeup last for days. These products usually contain a variety of added ingredients that can irritate your eyes. Stick to basic versions of your favorite products instead. Chose products that are organic, fragrance-free or hypoallergenic. Avoid buying cosmetics that contain perfumes, preservatives, nickel, lead, sulfates, beryllium, added color, cadmium, parabens, talc, selenium or glitter. Keep your eyes clear and comfortable with smart makeup choices and regular eye exams. If it's time for your next eye exam, or you're concerned about a problem, contact us to schedule an appointment.